This 8-piece steak knife set will look great at the holiday table or for family dinners. Cleaning is easy, since they’re designed with dishwasher safe and corrosion-resistant stainless steel blades and handles. They’re made in a single piece with no seam, so they won't collect food or debris. The knives have a serrated edge that will never need sharpening. If you don’t need all the knives for dinner, the spares will come in handy in the kitchen, too, as a utility knife or for slicing tomatoes or cutting sandwiches for lunch. Couples and small families don’t need a huge array of steak knives taking space in storage, so this 4-piece set makes sense for special family dinners, but they won’t eat into the steak budget. They’re made entirely from stainless steel with a high-luster finish and a swooping design on the handle that will look good with any flatware you already own. The knives have a serrated edge for easy cutting and have weight to them that suggests quality construction. These are dishwasher safe for easy cleaning. If the flight design doesn’t fit your style perfectly, the company makes similar steak knives with different handle designs to better match your flatware. There’s no good place to store steak knives – they don’t fit in the silverware drawer, and there’s no space in the knife block. This set comes in a wooden box that makes storage easier, so you can grab them for special occasions and tuck them away when not in use. The box has a mahogany stain that looks elegant, and a velvet lining keeps the knives safe from scratches. The knife blades are made from precision-forged high carbon stainless steel and have a full tang and serrated blades for easy cutting and no need for sharpening. The handles are made from stainless steel and have a contemporary look that will complement any flatware set. These should be hand washed with a mild detergent, then dried for storage. These beautiful knives have rosewood handles and a straight edge that is easy to sharpen, so they’ll last a lifetime. The high carbon stainless steel blades provide optimum sharpness and are ice tempered to retain that sharpness for longer. These stamped blades have no bolster, so you can cut along the full length of the blade, and this also makes them easier to sharpen at home. The handles are ergonomically designed, so they’re easy to hold, and the full tang and triple rivets provide security and good balance. This set of six knives is designed to perform like your kitchen knives, and should be treated the same way. Hand washing is recommended. These round-tipped steak knives offer a contemporary look with a little safety tucked in, since there’s no point for accidental knife pokes. The knives are handmade in Switzerland by the same folks who make Swiss army knives and have a serrated edge for smooth, easy cutting. The blade is mirror polished, so they’ll look beautiful at the table. The handle is made from proprietary Fibrox material that is slip resistant and easy to keep clean. The handle shape is ergonomic and easy to grasp, with a bolster for safety. This is a set of six knives. They are dishwasher safe for easy cleaning. When it’s party time or a big holiday is coming, steak knives can come in handy for that roast you’re serving, or to replace the beat-up flatware knives that aren’t fit for display. But who wants to spend big bucks on knives that will go into hiding when the party’s over? These knives are budget friendly and come in a set of eight, so you can stock up for an occasion and tuck them away with the tablecloths when the party is over. They are made entirely from stainless steel and are corrosion-proof and heat resistant. The knives have a thickened ergonomic handle, serrated cutting teeth and they look stylish at any table. These are dishwasher safe, but should not be soaked for long periods. They should be dried after washing to maintain the appearance. The included wooden knife storage block, hand-crafted from acacia wood, fits neatly into a drawer or onto a shelf so you can keep the knives safely stored when not in use, while still easy to grab when you need them. 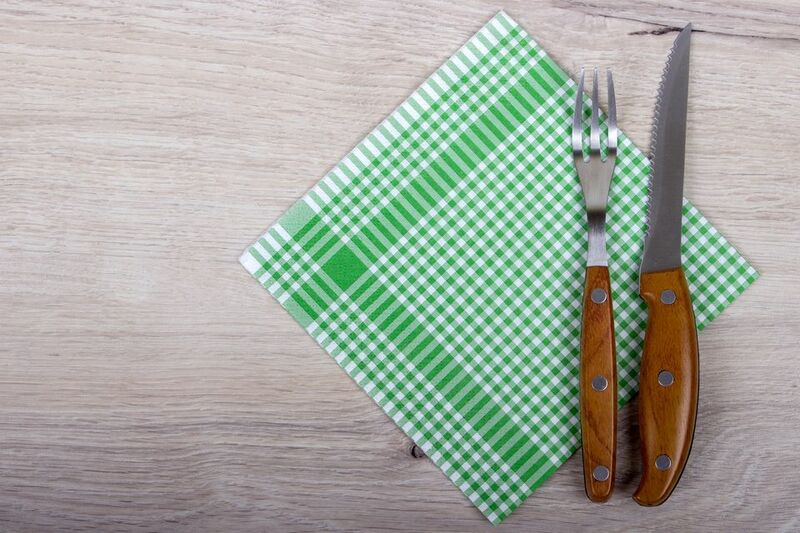 The set includes 8 knives, so you’ll always be ready for a family dinner or small party. The knives have a classic-looking black handle with a full tang and a patent-pending angled bolster for a firm, safe, pinch grip. The blades are made from German steel with a super-sharp 16-degree edge with serrations that make cutting a breeze. While users have reported that they have washed these in the dishwasher, they are quality knives that would benefit from hand washing. You might not know what Laguiole means, but the distinctive style of these knives will certainly look familiar. The original Laguiole knives were made in the south of France and these were inspired by that classic design. They have a unique pointed blade and thin handle that is stamped with the iconic Laguiole bee symbol. The knives have a beautiful pakka wood handle that is moisture resistant and strong. The blades are forged and serrated blades for easy cutting while the full tang and triple rivets offer security. There are six knives in this set. They come in a box for easy gifting.